Welcome to Leafly’s live coverage of the 2018 midterm elections. With cannabis reform measures on the ballot in four states, this election could mark another moment of progress for the legalization movement. Leafly will be updating this page with as-they-happen results, dispatches from correspondents across the country, and commentary from around the cannabis community. We’ll also be providing regular video updates from Leafly HQ on Periscope and Facebook Live. What’s at stake? 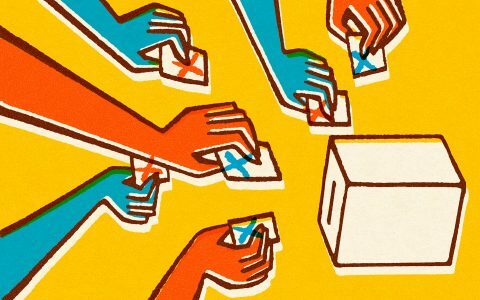 Skip down to see the races we’re watching, or take a gander at our complete guide to the 2018 ballot. 10:23 p.m. — Here’s what we know at the end of Election Night 2018: America still loves legalization. In fact, more Americans love legalization. They love it in Michigan, where the home state of John Sinclair (look him up) finally took its rightful place as a cannabis leader by passing adult-use legalization and becoming the first heartland state to do so. 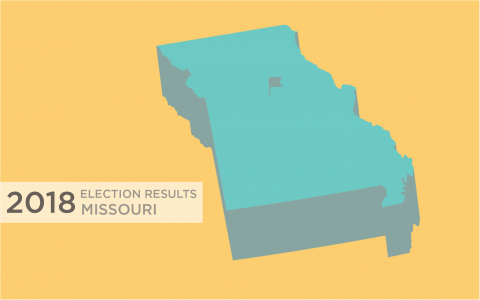 They love it in Missouri, where voters took the time to sort through three similar (but very dissimilar) medical marijuana measures to find the one that made the most sense. And then passed it by a whopping margin. They love it in Utah—Utah! !—which is surprising but maybe shouldn’t be seen as a complete shock. Medical marijuana legalization did pass in Arkansas, Oklahoma, and North Dakota, after all. If Utah goes medically legal, Wyoming and Idaho can’t be far behind. Speaking of North Dakota: Well, North Dakota, you tried. After surprising the nation by legalizing medical cannabis in 2016, advocates there shot the moon and went for full adult-use just two years later. With a measure that was all legalization, no regulation. That didn’t work out so well. Maybe there’s a lesson in there. Legalization advocates shed an adversary in this election—the notorious Rep. Pete Sessions (R-TX)—but they also may be losing a valuable advocate in Rep. Dana Rohrabacher (R-CA), whose long run as the iconic Orange County conservative looks like it might be coming to an end. With the House of Representatives now in Democratic control, there’s fresh opportunity for a breakthrough on federal prohibition. The STATES Act, the Marijuana Justice Act, and other long-languishing bills have new hope, but still face an uphill battle in the Senate. The good news: 1 in 4 Americans now lives in a state where cannabis is fully legal for all adults. Canada just legalized nationwide last month. Mexico’s Supreme Court abolished cannabis prohibition last week. It’s time for America to get moving. 10:10 p.m. SAN FRANCISCO — Illinois’ new Governor-elect J.B. Pritzker comes from a family whose political donations helped ensure cannabis legalization in California and across the US. Pritzker, a venture capitalist, is second cousins with Nicholas Pritzker, who is also a venture capitalist who donated at least $500,000 to California Proposition 64, according to reports. Nicholas’ son, Joby, is on the board of leading reform lobbyist Marijuana Policy Project, reports indicate. The Pritzkers are heirs to the Hyatt Hotels family and also strongly backed California’s Governor-elect Gavin Newsom. Governor-elect J.B. Pritzker has no financial ties to Nicholas and Joby’s venture investments in cannabis, which include Pax and MJ Freeway, reports state. J.B. Pritzker also sold off most of his Hyatt shares as well, reports state. But J.B. Pritzker is pro-cannabis, and his circles include folks extremely knowledgeable about legalization, which polls at 66% in Illinois, mirroring national trends. “Illinois is going to be legal for years before New York state gets it together,” said Sean Donahoe, a cannabis industry consultant in California. 9:43 p.m. — We expected Rep. Dana Rohrabacher’s re-election race to be tight, and it’s proving to be one of the nation’s last great too-close-to-call races tonight. Rohrabacher, a longtime conservative cannabis legalization champion, is fighting for his political life against Harley Rouda, a Democrat who used to be a Republican until Trumpism drove him out of the party. 9:36 p.m. SAN FRANCISCO — Longtime medical marijuana activist Cody Bass is set to take a leadership role in the town that once persecuted him—South Lake Tahoe, CA. The longtime dispensary owner who battled local officials to stay open now holds second place in a nine-way race with 26% of the vote counted. 9:19 p.m. SAN FRANCISCO — US Sen. Dianne Feinstein widened her lead in early returns in California over her democratic challenger Kevin De Leon. With 17.9% of precincts reporting Feinstein has a 54-45 edge over De Leon. Anti-cannabis Republican Rep. Devin Nunes of Fresno bested his challenger with 57% of the vote after 12% of precincts reporting. In the battleground 25th district, Republican Steven Knight is in a dead heat 50-50 with 30.4% of precincts reporting. And pro-cannabis Republican Rep. Duncan Hunter is prevailing in battleground district 50. Hunter has 53.5% of the vote with over one-third of precincts reporting. Oakland Measure V seemed on its way to passing with 77% of the vote after 17% of precincts reporting. Oakland cannabis taxes might actually be going down thanks to Measure V.
Fresno’s cannabis Measure A— a business tax of 10%—was passing handily 71-28 with just under 20% of precincts reporting. Santa Clara’s Measure M business tax passed handily in early returns 72-27% with 84% of precincts reporting. 8:56 p.m. SAN FRANCISCO — US Sen. Dianne Feinstein leads in early returns in California over her democratic challenger Kevin De Leon. With 5.6% of precincts reporting Feinstein has a 52.2% edge over De Leon. 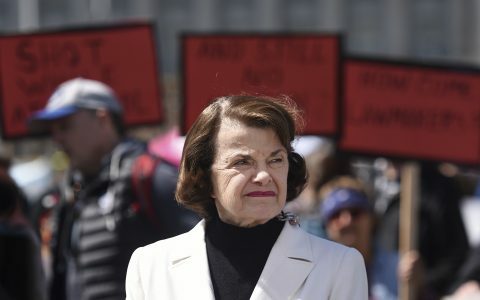 Sen. Feinstein was a drug war hawk who has since risen to defend California’s legalization policy. — Los Angeles Measure B to pave for the way for a city-run cannabis bank was losing, 38 to 61, with 561 of 4,165 precincts reporting. — In the battleground 25th Congressional district, anti-cannabis Republican Steven Knight is in a dead heat 50-50 with his democratic challenger 30.4% of precincts reporting. Good Night, Missouri. Sleep Well. 9:25 p.m. ST. LOUIS — The party’s over here, and the day is won. Now comes the hard part. MMJ advocates face a solid year of fighting to keep the regulations reasonable and the industry solid. But for now, enjoy the victory. 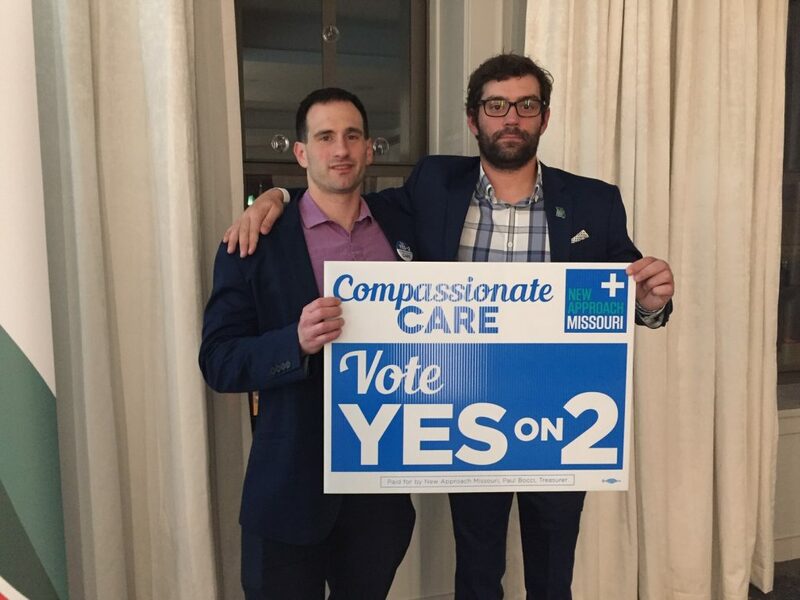 Our work here is done: John Payne (left) and Chris Chesley of New Approach Missouri can take their signs and go home. And finally sleep. 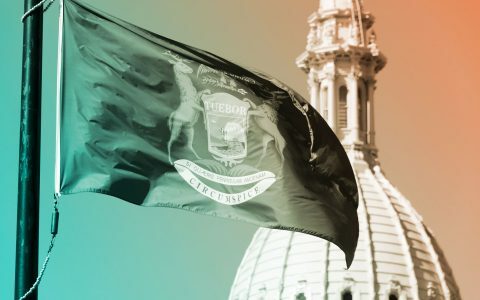 Michigan will become the 10th state to legalize the adult use of cannabis, and the largest state (10 million population) after California. With 55% of the votes counted, Proposal 1 holds a healthy lead with 58% of the yes vote. Utah will become the 32nd state to legalize the medical use of cannabis. With 54% of the vote counted, Proposition 2 leads steadily with 54% of the yes vote. 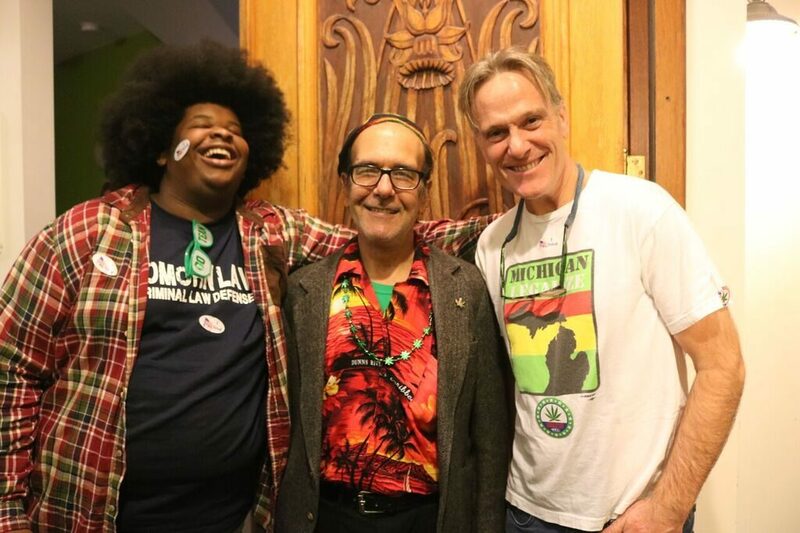 8:21 p.m. SAN FRANCISCO — Longtime legal cannabis champion, former San Francisco mayor, and Lt. Gov. Gavin Newsom will take the helm of California as its new governor. Watchers called the race for the democratic gubernatorial candidate from San Francisco within minutes of the polls closing in California at 8 p.m. local time. 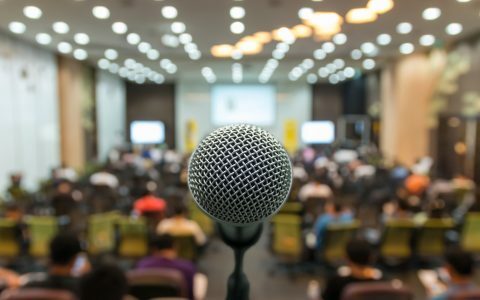 Newsom will preside over the final implementation of legalization Proposition 64 as California finalizes its cannabis industry regulations this month. 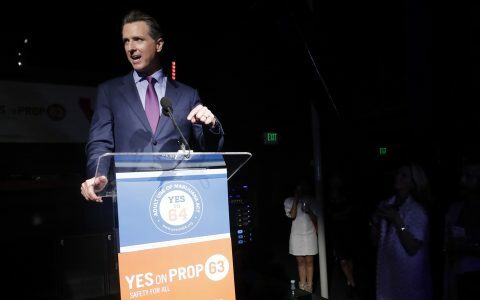 Newsom stumped for Prop. 64 in 2016 after leading a blue ribbon commissioner to outline the landmark legalization law. 8:08 p.m. — Three statewide cannabis legalization measures are now final enough to call. 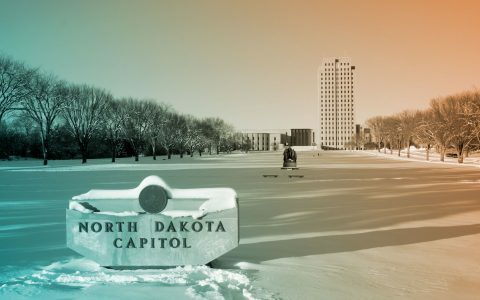 North Dakota voters have defeated Proposition 3, an adult-use legalization measure that would have removed all criminal penalties for nonviolent cannabis activity. Nationwide, Democrats are also now projected to take control of the US House of Representatives—a move that could mean movement on federal legislation to legalize or deschedule cannabis. 8:01 p.m. — Holy smokes, do cannabis advocates loathe them some Pete Sessions. The Texas Congressman, a Republican from the Dallas suburbs, has been the chief obstacle for both legalization progress and simple compassionate protection for millions of medical marijuana patients nationwide. And he just lost his seat. The outpouring from national cannabis voices has been something like a Hallelujah chorus. For anyone who’s read Good and Mad: when Rep. Barbara Lee explains the lengths she went to to control her anger during an exchange over her AUMF repeal being stripped from bill, that exchange was with Pete Sessions. Sessions just lost his seat. And Pete Sessions goes down! The biggest road block to marijuana reform in the House. Watching Pete Sessions lose is a special joy for the former Texans here in my Brooklyn house. 7:47 p.m. ST. LOUIS — With Missouri’s Amendment 2 holding steady at 64%, everyone at the watch party is cutting loose. 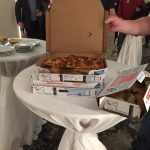 One very kind supporter in attendance just ordered enough pizzas and garlic breadsticks for everyone here and then she dropped them on cocktail tables all around the room. All weed parties should have a pizza fairy. 7:38 p.m. Huge news: US Rep. Pete Sessions (R-TX), a longtime legalization opponent who has consistently blocked cannabis reform measures in Congress, is projected to lose his seat, according to CNN. With 31% of precincts in Texas reporting, challenger Colin Allred, a Democrat and former Obama administration official, holds a 52–46.3 lead. While the Associated Press hasn’t called the race just yet, removing Sessions from the House could mean big things for cannabis reform. US Rep. Earl Blumenauer (D-OR) has said he’ll push for federal cannabis reform if Democrats take control of the House. And Sessions—if he sticks around—is seen as one of the leading opponents. 7:05 p.m. ST. LOUIS — John Payne, campaign manager for New Approach Missouri, just asked for the music to be turned down so he could address the crowd. New Approach Missouri’s John Payne: Very optimistic as the votes come in. He announced that there are about 200,000 votes counted so far, and that Amendment 2 has pulled ahead of Amendment 3 (70% to 42.3%) and that, even more importantly, Proposition C is sitting at a mere 52.8%. The crowd raised their glasses and cheered as Payne said that though there are an estimated 2.3 million votes to be counted tonight, they have every reason to be optimistic that Amendment 2 will emerge the winner. 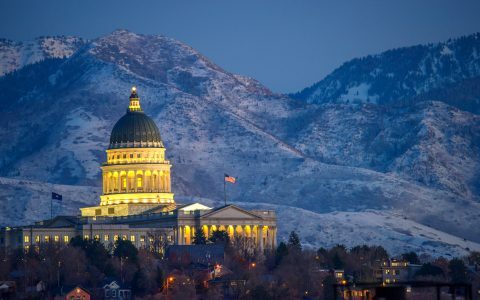 7:05 p.m. Nobody was quite sure how today’s vote on medical cannabis in Utah would turn out, but early returns give the legalization measure a considerable lead. With 21% of precincts reporting, Proposition 2 is showing 64.3% support. Regardless of what happens at the polls, the state Legislature is expected to reconvene later this month to pass a more restrictive medical cannabis bill—a compromise struck last month amid a particularly combative campaign. The proposed compromise, which has the support of political and religious leaders in the state, would forbid home cultivation, limit the sale of smokeable cannabis, cap the number of dispensaries statewide, and impose other restrictions not included in Prop. 2. 6:49 p.m. ST. LOUIS — The first batch of poll results are just now reaching the growing crowd at the watch party hosted by New Approach Missouri at the Angad Arts Hotel in St. Louis, MO. Supporters here are hoping that Amendment 2 wins out over the two other (more restrictive) medical marijuana measures that were on the ballot today. With only 1% reporting, the numbers so far show their Amendment 2 tied with the competing Amendment 3—both are at 71.6% yes. Proposition C is currently only at 56.2%, so everyone here is hopeful. It’s a party here in the ballroom, even with the room not quite filled out yet. The DJ is blasting funk music and club classics like Indeep’s “Last Night a DJ Saved My Life” and everyone here is in a friendly, celebratory mood. Most of the people here seem to know each other from working together, canvassing or gathering signatures. The drinks are flowing and one kind fun-loving supporter is even offering journalists tastes of some of Snoop Dogg’s Green Crack strain. 6:11 p.m. DETROIT — Spirits are high—and so is most everyone at the election night watch party in the Detroit offices of Matt Abel, founder of Cannabis Counsel and executive director of Michigan NORML. 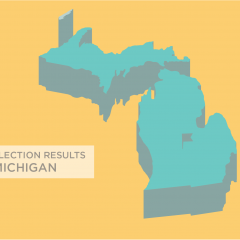 At 9:15 p.m. local time, Michigan’s adult-use legalization measure, Proposal 1, was polling at 60% yes with 8 districts reporting. Private investigator and cannabis advocate Steve Miller, a former law enforcement official, beamed with delight as he talked with friends old and new. 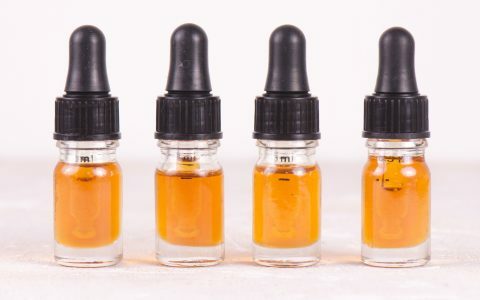 About cannabis, Razor Ray Reyes said simply, “It saved my life.” He cites a brain aneurysm, which he said was healed despite his doctors’ inability to treat it—a healing he credits to CBD. People continue to stream in to the watch party as poll results come in—we’ll have more from Michigan as the votes are counted. Will Connecticut’s Next Governor Push for Legalization? 6:11 p.m. — Pro-legalization advocacy group Marijuana Policy Project says Connecticut’s gubernatorial race “may determine the state’s future on marijuana policy” given the “very clear contrast” between the two candidates. 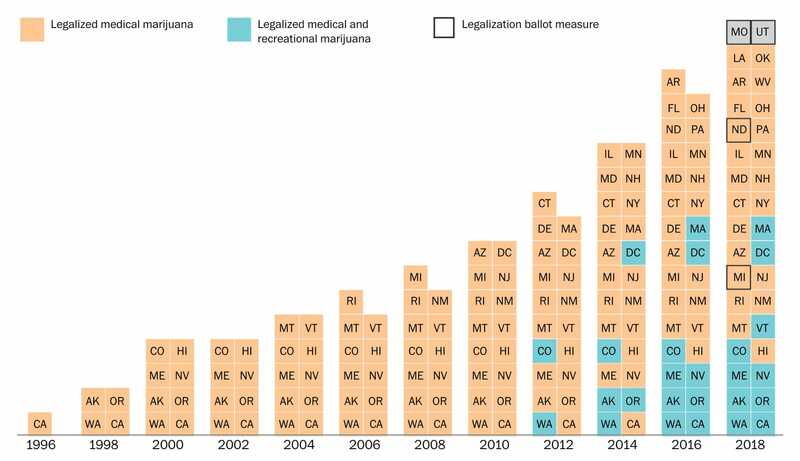 Lucky for cannabis voters, the candidate in favor of legalization is in the lead—for now. We’ll keep an eye on the race for you, but with 7% of precincts reporting, Lamont has a slight lead, 49.2%–47.1%. 6:09 p.m. — With 1% of precincts reporting, Amendment 2 (legalization of medical cannabis with a 4% tax) has taken an early lead, with 67% of voters embracing the measure. Prop C, medical with a 2% tax, has a slight 52% lead, and Amendment 3 (15% tax) is trailing, with 59% voting no. Again, it’s early—only about 10,000 votes have been counted. Stay tuned. 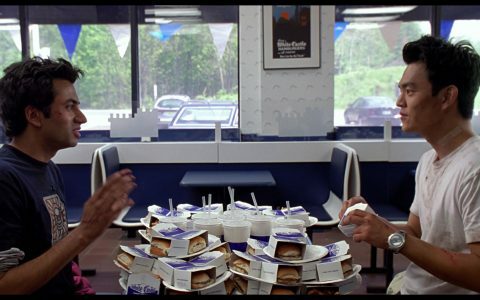 White Castle Is Against a Drug Reform Measure. We Asked Them Why. 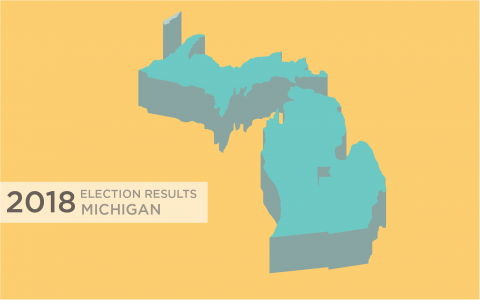 It took nearly a half an hour after polls closed in Michigan to see the first election returns, and while the signs for cannabis legalization were initially promising—a 53–47 lead right off the bat—that quickly flipped to show a two-point lead for opponents. Minutes later, the race turned again, putting legalization ahead 56–44. The takeaway? With just 1% of precincts reporting, it’s too early to draw conclusions. Stay tuned. It’s 8 p.m. Polling places have now closed in #Pennsylvania #NewJersey and #Delaware. 4:50 p.m. — With a small percentage of the vote tallied, Ohio’s Issue 1, a measure to reduce penalties for a variety of drug crimes, is trailing badly. With just under 800,000 votes counted, the No votes outstrip the Yes votes, 59% to 41%. 4:45 p.m. — Hemp remains quasi-legal in the United States, with domestic production allowed only under state-level pilot programs. But in Kentucky, where hemp has been grown for hundreds of years, elected officials are finally catching on to the plant’s potential. In recent years they’ve led the charge to expand hemp’s legality nationally. He opposes both medical and adult-use legalization and doesn’t want veterans to have access to medical cannabis. Shortly after polls closed Tuesday, the Associated Press projected that incumbent Rep. James Comer (R-KY), the main sponsor behind House legislation to legalize hemp, would be reelected by a wide margin. Provisions of his 2017 Industrial Hemp Farming Act are expected to be included in a forthcoming farm bill. While Comer supported loosening hemp rules, his support for the cannabis plant itself is limited. He opposes both medical and adult-use legalization at the state and federal levels, supports the federal prohibition of CBD, and doesn’t want veterans to have access to medical cannabis. 4:42 p.m. — All three states, which have cannabis legalization measures on their statewide ballots, close at 5 p.m. Pacific Time. The first returns are expected about 15 minutes later. Stay tuned, we’ll have the first numbers direct from state election officials. 4:31 p.m. — And 30 minutes into the counting, both governor’s races are too close to call. We have a feeling it’s going to flip-flop 51-49, 49-51, for the next hour or two. 3:48 p.m. — Reports from Fargo and Bismarck say it’s a-snowing up there, which isn’t too unusual as it’s November in North Dakota. So yes, it’s cold (30 degrees) but nothing they’re not used to up there. And they say the early voter turnout has been spectacular, with more pre-Election Day voters than in the 2016 presidential vote. In fact, the Bismarck Tribune reports that there were more ballots cast by last Friday—four days before Election Day—than were cast in total during the 2014 midterm election. As is also normal for North Dakota, nobody knows whether that swell of early voters will be a good or bad thing for the statewide adult-use legalization measure. 3:11 p.m. — Upward of $5.2 billion will be spent this election cycle, the Center for Responsive Politics has estimated, making it the most expensive midterm election in American history. How much of that had to do with legal cannabis? 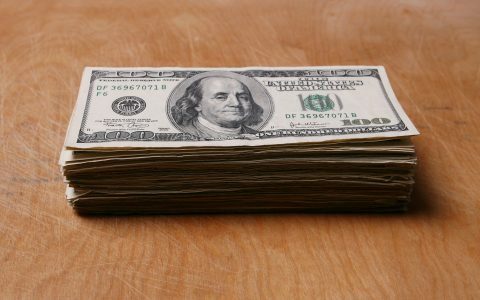 Campaigns for and against legal cannabis campaigns in Michigan, North Dakota, Utah, and Missouri raised more than $6.6 million, according to a back-of-the-envelope calculation. That leaves out local measures, like all the cannabis tax issues in California. Of the roughly $6,636,858.80 raised around state cannabis issues this election, it’s hard to say how much was spent. The latest campaign disclosures in some cases are multiple weeks old, and advertising buys often spike in the last several days of the campaign. Assuming every penny was spent, however, legal cannabis made up about 1.3% of campaign spending in 2018. 2:38 p.m. GRAND RAPIDS, MI — Poll workers in a lower-income neighborhood in Grand Rapids’ south end were enthusiastic this afternoon about the high voter turnout they’re experiencing. “I’ve seen way more people come through than they did on the last presidential election,” one volunteer observed. In the 2016 general election, the location’s total turnout was 988, yet by 3 p.m. today the same location had received more than 700 voters—with six hours, including the after-work crowd, yet to go. Voters have comprised of all ages and demographics, with one volunteer noting a particularly high number of young adults. At 3:30 p.m., Grand Rapids’ precincts were polling at 39% voter turnout. As of 4:30 p.m., the city website posting live results had crashed due to high traffic. If Grand Rapids—a considerably more politically conservative area than the eastern side of the state—is any indicator of today’s results, it’s shaping up to be a good day for cannabis legalization in Michigan. 2:29 p.m. — If Michigan passes adult-use cannabis legalization, as voters are expected to later this evening, that would put the total population of adult-legal states at 80 million. That would mean that fully 1 in 4 Americans, 25% of the population, live in a state where cannabis is legal for all adults. Michigan: As of this weekend, the number of absentee ballots issued and returned statewide was up by more than 50% from the last midterm election, in 2014, the Detroit Free Press reported. The state’s former elections director has estimated that 4 million people could vote in the election—marking the highest turnout for a midterm in nearly 50 years. North Dakota: The Secretary of State’s office says North Dakotans turned out in record numbers to vote early, with more than 144,000 ballots being cast before Election Day. That doesn’t mean the get-out-the-vote effort is slowing down: Poll workers today say they’re impressed by how busy they’ve been so far. 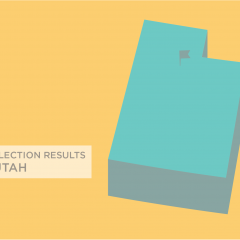 Utah: More than half a million Utahns—that’s 40% of registered voters in the state—had turned out to vote early as of Friday afternoon, according to state Director of Elections Justin Lee. By comparison, only 46% of voters in total cast ballots in 2014’s midterm. 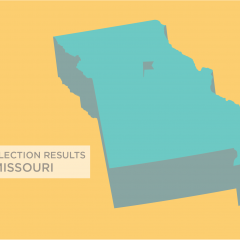 Missouri: Missouri doesn’t really have early voting, despite what a flurry of texts from Republicans last week might say. The state does offer absentee ballots to voters who won’t be able to make it to the polls, but even those are allowed only in limited circumstances. Which means that if you’re reading this from Missouri—GO VOTE! Polls close at 7 p.m. local time, and you’re allowed to cast a ballot as long as you’re in line by that time. Find your polling place now. Keep in mind that lines may be long, due both to turnout and alleged voter suppression. Reports are coming out that some poll workers are denying ballots to voters with student IDs, despite a student ID being a valid form of identification under state voting laws. The old red/white/blue curtains were replaced with solid reds and blues. The eight booths were lined up with blue curtains on the left, red on the right. Multiple residents complained that the arrangement was unnecessarily divisive. 10:56 a.m. — This exchange between cannabis advocate and writer Tom Moreno, and Harborside Health co-founder and California pioneer Steve DeAngelo, pretty much sums up the dilemma for many liberal legalization advocates. Rohrabacher is currently in a dead heat to retain his seat in Orange County. Happy Election Day! As you know, there are two reckless proposals to legalize marijuana in North Dakota and Michigan that will be voted on today. We certainly hope commonsense will prevail and voters will defend public health by rejecting the empty promises of Big Marijuana. 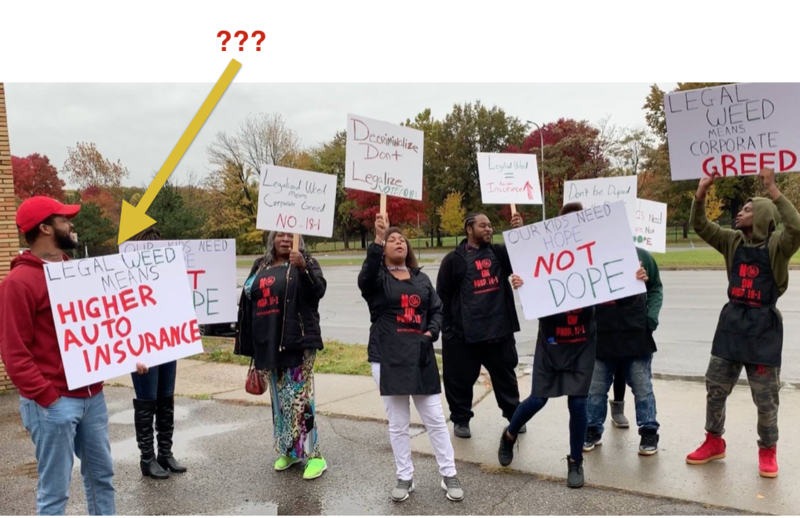 And, with respect, we’re up for a good protest (anti-legalization gathering in Michigan, below, from the SAM feed) with handmade signs. But this is the point we’ve reached with prohibitionists scrambling for arguments against legalization: “Legal Weed Means Higher Auto Insurance.” We don’t think that’s true—but even if it is, is that really the best ya got? 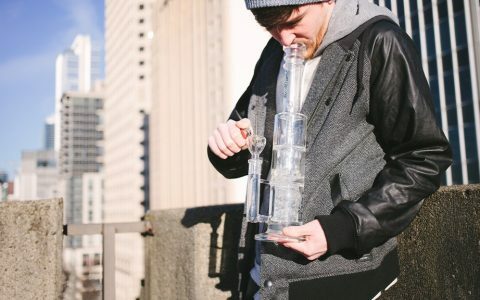 10:11 a.m. — Need new bong? Time to upgrade to a dab rig? In case you didn’t have enough of a reason to do your democratic duty, online glass shop Smoke Cartel is offering a dope Election Day deal: Send them your “I Voted” sticker to show you’ve cast your ballot, and Smoke Cartel will send you a code for 50% off your order. Not bad. Update: Puffco is also offering a voter discount—10% when you show your “I Voted” sticker. Make your voice heard and #vote today. 🇺🇸 Send us your “I Voted” sticker and we’ll send you a code for 50% off! 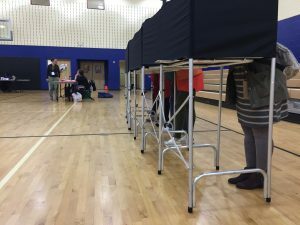 9:55 a.m. — Michigan voters could be affected at the polls Tuesday amid high winds that have brought scattered power outages to the state, the Associated Press reports. Six polling places in southeastern Michigan lost electrical service this morning, primarily in suburban Detroit. DTE Energy has said it has mobilized employees to make sure polling places get quick attention. Power at affected polling places was restored on average with in 45 minutes, the company said. Find your Michigan polling place. Illustration by Kate Rabinowitz for The Washington Post. Michigan and North Dakota will decide statewide measures on the legalization of adult-use cannabis. Utah and Missouri will consider medical marijuana legalization initiatives. Local municipalities in California are considering a ton of cannabis tax-and-zoning measures. Other states will consider smaller reforms or advisory measures, including Ohio and Wisconsin. 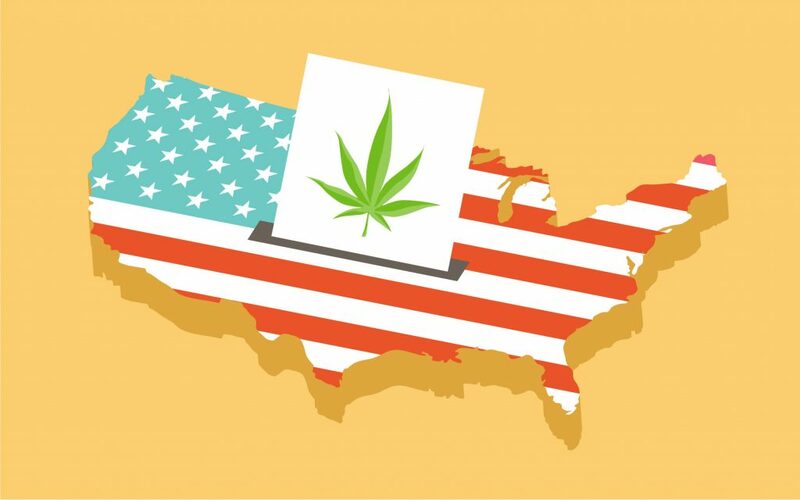 Several Congressional races critical to cannabis reform are neck-and-neck, including seats belonging to Rep. Dana Rohrabacher (R-Calif., pro-legalization) and Rep. Pete Sessions (R-Texas, anti-medical cannabis). North Dakota Measure 3 All over the place. One polls shows 51% support, another shows 26% support. Wisconsin County-by-County Advisory Referendums 16 of Wisconsin's 72 counties 16 counties will vote on cannabis policy. Some on medical, some on adult use. All will be non-binding, advisory votes only. Los Angeles, CA Measure B Los Angeles cannabis industry Would allow City of LA to establish a city-run public bank, in part to serve the cannabis industry. 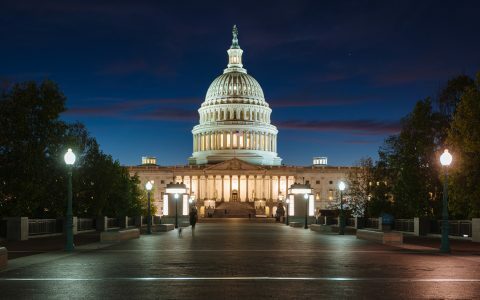 If Democrats take control of the House, Blumenauer said, congressional committees during the first quarter of 2019 would hold hearings on matters like descheduling, scientific research, and financial services for growers and entrepreneurs. By the second quarter of 2019, lawmakers would begin marking up already-introduced legislation in order to combine them into a single cannabis package that narrows the gap between state and federal law. The House would aim to pass the full package by Congress’s annual recess in August, then work with allies to push the bill through the Senate. “Our chances in the Senate depend on both the November elections and increased public pressure following House passage,” Blumenauer wrote. Rohrabacher, an old-school Republican conservative, has been one of the staunchest advocates for cannabis legalization in Congress over the past decade. He’s also a conservative in a district whose demographics have been changing. Once solidly red-Republican, the Orange County seat is now purple. Hilary Clinton won it by two points in 2016. Rohrabacher now faces Harley Rouda, a former Republican who acted on his Never Trump instincts to switch parties. He’s now in a tight race that’s coming down to the wire. Sessions, no relation to the US Attorney General Jeff Sessions, is the longtime Congress member from the Dallas suburbs and his seat would be of no interest to us but for one thing: Sessions adamantly refused to allow the Rohrabacher-Blumenauer Amendment, the budgetary measure that is the sole federal protection for medical cannabis patients nationwide, to move through his committee. Why? Presumably he thinks medical cannabis patients are all a bunch of stoners. Sessions may be one of the last men in America to think this way. But because he’s a House committee chair, he’s in a unique position of power and has used it to put the health of millions of cannabis patients at risk. 11:21 AM PST SAN FRANCISCO—My, what a long strange trip it’s been for John Boehner. The Republican ex-Speaker of the House just penned an editorial for the Wall Street Journal arguing to ‘legalize it,’ Peter Tosh-style. In an opinion article, “Washington Needs to Legalize Cannabis,” Boehner recounts how reports from friends and loved ones about the relief they found with medical cannabis helped change his mind on the issue. Nine states have spoken on recreational use, Boehner notes, and cannabis could help blunt the damage of America’s opioid epidemic. He invoked the Tenth Amendment and the threat of a liberal “nanny state,” and called for the rescheduling of cannabis, which is currently treated like heroin by the federal government. 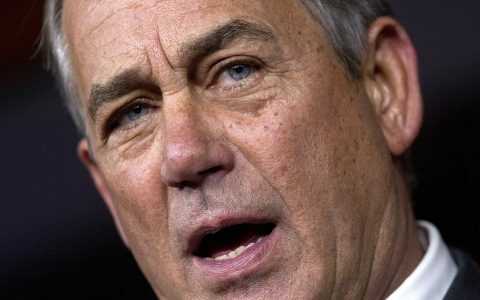 Critics note Boehner seems to work best when he’s got skin in the game. Boehner joined cannabis company Acreage Holdings in April. That’s a pretty serious turnaround for the Ohio Republican who served as a US representative from 1991–2015, the peak of mass incarceration in America. How’d They Vote on Cannabis? SAN FRANCISCO—How would know if your local representative in Congress cast terrible votes on cannabis? The Cannabis Voter Project kept the receipts. The online voter education tool made a last-minute push to educate single-issue voters Monday, using celebrities to encourage voters to look up and potentially vote out representatives who were awful on drug reform. The website experience is slick. You click on your state—like California—on the homepage map, and it populates with “Where Do California’s Senators Stand?” The site also lists all your state’s congressional representatives. Representatives like Rep. Devin Nunes (R-22nd District) have a score of zero out of seven, meaning Rep. Nunes did not support any key congressional cannabis law reform bills. By contrast, Rep. Dana Rohrabacher of (R-48th District) has a stellar 7–0 record on cannabis. In another closely watched California race, Rep. Darrell Issa (R-49th District) has the opposite—a 0–7 cannabis voter score, including a “D” grade from NORML. 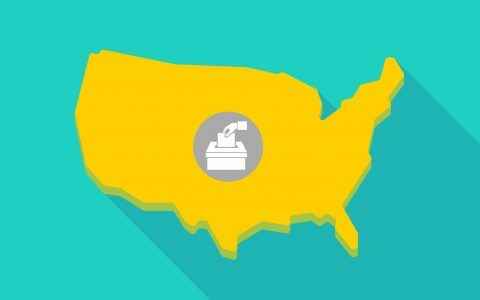 Cannabis Voter Project comes from HeadCount.org, a nonpartisan group aiming to educate Americans about how voting counts. 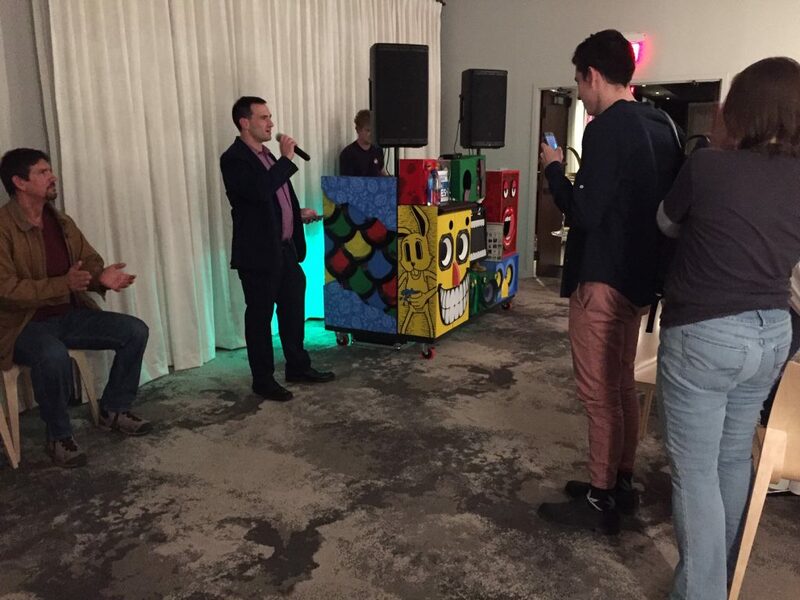 Since 2004, HeadCount has helped register nearly 500,000 people to vote at more than 1,000 live music events each year, including tours by Dead & Company, Phish, G-Eazy, Paramore, and Dave Matthews Band. And you know the band Lettuce is all about it. Utah Voters Just Legalized Medical Marijuana. Will It Matter? Very cool! Nice work, David! I’m going to smoke a Congalese Red! Great night and I’m so happy Dana Rohrabacher is gone. He was great on cannabis and absolutely horrible on everything else. But don’t worry I’m sure pooty will tell drumpf to give Dana a job. Spoken like a true trumptard.